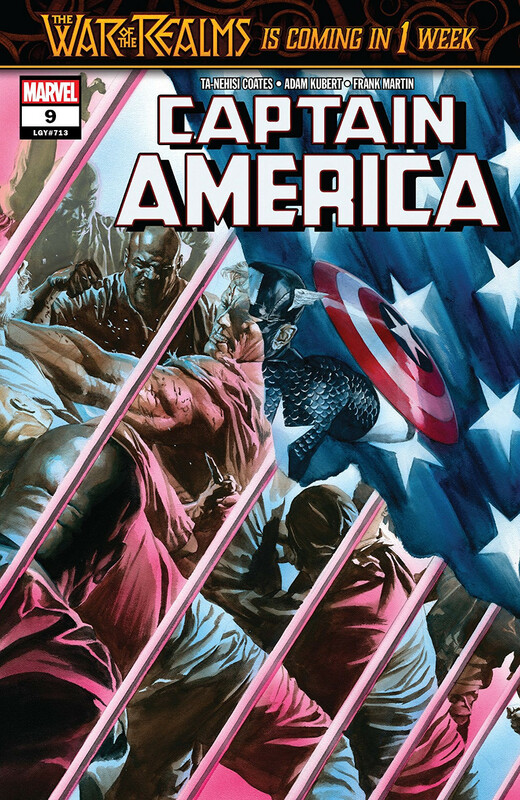 At the core of Captain America #9, there's a pretty cool, pretty subtle story about Steve Rogers' identity crisis. Continued confusion between Proper Steve and Stevil is causing havoc both inside and outside the Myrmidon prison. Wrapped around that story is the more problematic tale of what Steve's hero-pals are doing to help him. The mysterious Dryad takes the field to put "the Foreigner," the international gangster who orchestrated General Ross's killing, on notice. And the Daughters of Liberty? The all-star roster of female heroes with decades of backstory and passionate fans and superpowers out the wazoo? They … support the Dryad by holding a meeting. Merciless Meeting Action! It's a Ta-Nehisi Coates comic, all right. Rounding out the plot threads, we also get solid peeks at what Alexa Lukin and Strucker are up to. These play better than some of the previous antagonist scenes (like #8's bewildering Selene interlude), revealing tempting details and solid hints about the baddies' larger plans. Adam Kubert packages all the threads together with consistent art that goes heavy on the realism. His talent is especially impressive in facial close-ups, all of which come across as detailed, naturalistic portraits. He blocks out the issue's action scenes with great skill, including a memorable fisheye overhead view of a prison cafeteria fight. But the art stumbles a little in the middle ground. Pull the frame far enough away from the characters and they become indistinct and cartoonish. This is particularly hard on the Daughters of Liberty and the Myrmidon prisoners; when they aren't wearing iconic costumes, they lose all sense of identity. The reader is left relying on the dialogue to recognize them; that's never a good thing. I maintain my antagonism to Frank Martin's colour choices. There's undeniable skill in the way he modulates light, and his shading is a significant enhancement on top of the linework. But his palette remains as relentlessly grim as a last-generation FPS game. There's a tiny flash of purple in the first post-title-page scene, set in a nightclub. But I get the sense that this is only allowed because Sharon and Misty are trading inconsequential pleasantries. On the next page, they're down to Serious Business for the big meeting scene, and Serious Business means relentless grey colouring for the basement setting. The gears of the plot continue to churn forward in a satisfying way. The closer the story gets to Steve, the better it is, and his narration is probably the highlight of the issue. As I've already implied, I wasn't a fan of seeing the Daughters relegated to off-page intelligence-gathering and then summarizing their findings for the mysterious new Dryad. Perhaps I'd be more interested if the Dryad wasn't leaning ruthlessly on the Black Widow's shtick. Ditch the hood and slap on an hourglass belt-buckle and she is the Black Widow, visually speaking. Her demeanour and behaviour are, if anything, even more Widow-like than her looks. This issue resoundingly failed to get me interested in the Dryad. Granted, new character introductions are never easy, but this one was considerably hamstrung by the unforgettable alternative. This issue could have turned the same action scene over to any combination of the Invisible Woman, Spider-Woman, Echo, Mockingbird, Misty Knight, White Tiger, and/or Agent 13. Mysterious blonde character borrowing heavily from the Black Widow? What's Yelena Belova up to these days?